I always forget to bring along tent stakes on my camping activities. At one time I was forced to gather some branches, sharpen them and use them as temporary stakes. And temporary they were because one of the stakes wasn’t strong enough to hold the tent for a day because of the heavy rain. 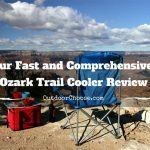 Ten stakes are one of that equipment we frequently take for granted or entirely ignore, especially for backpacking and camping until something like a strong wind or heavy rain reminds us of their necessity. I realized their value and importance the hard way. 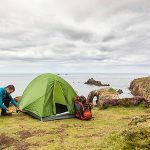 My objective in this article is to guide you into find the top performing tent stakes that best suits your needs and learn how to use them in such a way that they help give you a memorable and comfortable camping trip. Because what these stakes are for – the support of your shelter – is crucial for the success of your trip. While there are numerous kinds of stakes for various conditions – like sand stakes and snow stakes – in this article, we’ll be focusing on five best tent stakes to use in soil. There’s a different way of securing your shelter if you want to camp in areas without soil to fasten your stake into. Are you sick and tired of sleeping on a stuff sack crammed with random soft items? Do you know that bringing along a pillow can greatly improve your sleep and rest at night? 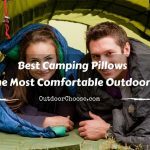 To look for the best camping pillow out there, you can check on the different models out there, which in your case, is a lot of research, or you can read this post till the end. 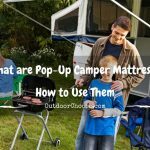 We’ve done our research and evaluation on the different camping pillows used for camping – whether it be in the backyard hammock, the back of a vehicle, and the backcountry, and then compared the fine points of both compressible and inflatable options. We evaluated them based on the fine points such as how they compressed down as well as if they offered a relaxed sleeping surface. Each brand has its pros and cons, and it will be up to you to determine which one is best for your situation. Read below to see which pillows we liked the most for campers out there! Rain, dew, or sudden downpour can slip inside any tent or shelter where there are holes or tears; big or small, on the material or in the seams. Whether your tarp or tent is fully waterproof and seam-sealed, unsealed, or factory-taped, it may eventually be necessary for you to maintain your tent to keep it in good shape and enhance its resistance against the elements. 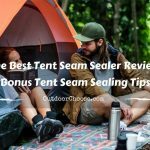 Luckily, we reviewed 5 of the best tent seam sealer in the market today for you. Also included in this post is the seam-sealing process which is pretty straight-forward and easy. You can easily do the entire seam-sealing process by yourself. Regardless of where or how you wish to camp, sleep is usually expected to be both restorative and comfortable. Because of this, the proper-sized mattress can certainly go a long way in giving you a relaxed state of mind. To get the right mattress size, the most recommendable option to acquire the current or trending mattress size. Also, note the available sizes that are often called Full size, Queen Size, King size, Twin Extra long, and California king. Moreover, it’s important to consider the material utilized to create the mattress. The most common is the memory foam; other materials utilized include latex mattresses, innerspring mattresses, Gel mattresses, air mattresses, water beds as well as dual purpose mattresses or beds. It’s worth mentioning that a few of these mattresses, although may have the proper size you require, may not be right for use in a camper.